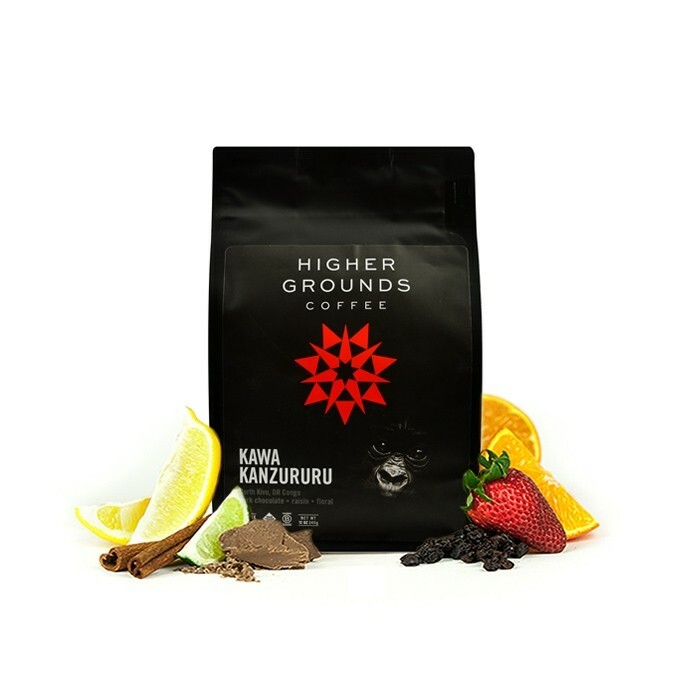 The Congo Kawa Kanzururu was carefully roasted for you by Higher Grounds Coffee. At the edge of the Virunga National Park’s snowcapped Rwenzori mountains, the 900 farmers of Kawa Kanzururu are collaborating in an economic model for peace and stability. This coffee has notes of dark chocolate and raisins with a soft floral aroma, for a complex and unique cup. I can't put my finger on it, but in general i do not like this coffee. I get a sort of bitter/soapy taste. Aromatics of raisin, floral, and really healthy soil. Taste is heavily of raisins with slight earthy undertones. Body and acidity was average. A raisin bomb but not much more for me. Maybe I just got a bad batch but this was so sour I had to throw it in the trash. It had a good. A little too chocolaty for me but it was good and I liked the complexity otherwise. Not my favorite but overall a good coffee. I personally prefer more of a fruit forward flavor. A major perk was the message foundation this roaster supports. This coffee tasted underdeveloped but I’ve never had a coffee from this origin so wasn’t sure what to expect. This is the second under-roasted coffee in a row that I have been sent, and the last I will receive from MistoBox. I'm furious that I've now paid $43.98 for two bags of trash coffee. Time to take my business to a source I can trust for better consistency. I loved this one. Had a bright flavor that gave way to secondary notes that I can't quite explain yet, but I really enjoy in a coffee. To me it seemed nuanced and interesting. not a fan of the raisin flavor. Maybe a little bit of a darker roast would be better. Smooth, smoky and chocolate. Nice cup of coffee. Don't like the sharp taste. Don't mind some fruitiness in coffee but this is too much. Nothing crazy, not really worth 22$. More like 15$. I think the roast is a little too dark on this one to fully enjoy it. Interesting coffee but not my favorite. More smoky than expected for my taste. Overall, really enjoyable. Just tasted dark. Bland, bitter, heavy, not at all enjoyable as a pour over. I will try using it in a press to see if it's any better. 26g of coffee. 418g of water. Slightly sweet, with nutty and earthy notes. Usually prefer more brightness, but this coffee was a great mix up. I liked this one once I got it dialed in. It's right at the edge of being too dark, but not quite over. This one is a bit darker for my preferable cup of coffee. I'll still drink and enjoy, however, I like a brighter cup of coffee. Good overall flavor but did not like the burnt taste. Didn't love the dark / tobacco taste. I enjoyed the smoothness of this bag and the chocolate undertone. The raisin was a just a hair overpowering though. Flavors are a bit muddled and hard to taste the notes. Notes of dark chocolate with a subtle sweetness. The coffee definitely changed its flavor profile with minute changes in the brewing process. Overextracted was overpowered with nutty tones while a slightly coarser grind/brew time make the brew too acidic. Definitely unforgiving should you deviate from a precise brew method. This is a solid balanced medium bodied coffee. There were hints of fruit and citrus, but nothing overpowering. My wife and I enjoyed it. Not much complexity here, but still an aromatic, smooth, juicy, and delicious coffee. This one was decent. Only reason why I'm giving it a 3 star is that the raisin note was overpowering. Raisins are okay tasting but not when their presence in food/drink is hefty. A little more boldness to the body and less raisin would have been a def 5. The complexity was nice. Not our favorite, especially compared to the Crema Barundi Gitwe we had last. This tastes thin and flat. it not my favorite it has a lot of raisin flavor. This was a solid coffee. It was very heavy raisin flavor. I was not able to get any notes of chocolate and missed any real complexity. The raisin was certainly the biggest note. The only complaint was the coffee seemed to stale quite quickly. Very juicy and well rounded with finishing notes of excellent dark chocolate. Made in a Chemex, V60, and French Press. Chemex was brewed over ice, which created a well-balanced and delicate cup that really let the citrus notes in this coffee shine. This was good, but definitely not as good as the Ruby or Kickapoo that I'd received prior. There were definitely notes of raisin and dark chocolate. It was overall a very balanced brew. Really good flavor paired with a light syrupy body. The raisin note is spot on. Lots of raisin on the palate. Pleasant cup overall. This was seriously dry. The flavors were okay, but it was closer to Raisin, and not "complex" at all as advertised. Solid coffee. Good flavor and very drinkable. Tasty, full-bodied rich and complex. Complex flavor. Hints of chocolate, very mild and delicate citrus. Loved it. This was actually good for a coffee from Congo. I’ve never had a good roast from Congo until now. The aroma of this coffee really threw me for a loop. It smelled like pure raisins, which i thought would make the coffee iffy, but it drank much nicer than the smell. Still, not my favorite. This was a good coffee!! I did a blind cupping with it and my previous coffee and could definitely pick up on the raisin and chocolate. 3 stars only because I tend to lean more towards fruitier, more acidic coffees. Thought this would be a little more chocolately but nonetheless the soft chocolate flavor together with the raisin is wonderful....a fine cup of coffee in the AM indeed. Had a hard time figuring out the best grind setting -- but very nice once I nailed it down. Ended up calling them and asking their advice. Honestly, this coffee just tastes like dirty water to me. I was hoping to have a better experience with my first coffee from the Congo, but was rather disappointed with this particular coffee. Didn’t get the complexity but overall it was solid. This coffee stretched me. I enjoy a good cigar from time to time and upon drinking this stellar coffee I was brought back to that flavorful first puff of a roromeo y julieta or H. upmann. Truly wonderful a coffee to taste. Send more from this region please. Don’t think I’ve ever tried anything from Congo. I love it.